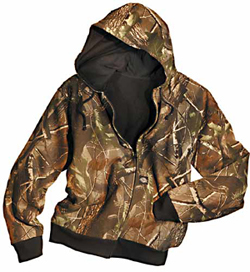 Dickies Camo 3-Way Parka in Realtree All-Purpose. After much searching on some of the internet retailers websites (Midway USA, Cabelas and Sportsman's Guide) I finally found a matching set of camo from the Sportsman's Guide. They were part of the Dickies Big Game Series. The Parka is a two-piece unit that has a removable fleece vest and removable hood. It zips, has a wind flap with buttons and has two large cargo pockets with two hand-warmer pockets behind. The Parka was $49.97 plus shipping. I purchased size large and it fit true to size. The Pants have an elastic waistband, belt loops, zip pockets on the front (no rear pockets and no cargo pockets) and legs that zip up to the knee, with button wind-flaps. The Pants were $24.97 plus shipping. The Pants run small. I usually wear a medium, but I had to send those back in exchange for a large. 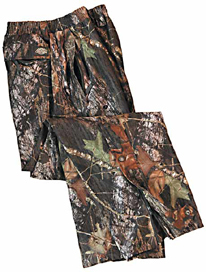 Dickies Big Game pants in Vanish camo. Both the pants and parka are comfortable when they are the only layer. I could wear the pants and parka without the fleece vest in 50-70 degree weather and be comfortable. For anything colder than 50 degrees, I would put the vest liner in the jacket. For cold, winter hunting, I wear the pants over longjohns and the parka with the liner vest, long underwear top and another cotton mock-neck shirt. This combination kept me comfortable in a tree stand for two hours on a 20 degree day with a 20 mph wind. The parka and pants do a great job of breaking the wind and the hood really helps. On another occassion, I was still hunting in the rain for three hours and (to my surprise) I stayed dry. The weatherproofing works and I hope that it doesn't wear off. Overall, I am very pleased with my purchase. I met all of my stated goals and I didn't have to break the bank to do it! Copyright 2008, 2016 by Jonathan Edwards. All rights reserved.